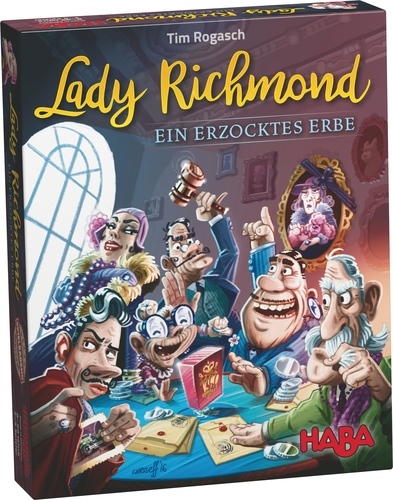 Lady Richmond is one of the three games in the Essen 2016 family game series – this is the new-ish attempt by HABA to make games for older gamers than their usual yellow box target audience. In this game, players are the family members of the recently deceased Lady Richmond, and they are fighting against each other to get the best share of the inheritance. For whatever reason, the stuff will be split up at an auction. There is a circular game board with seven card spaces on it – this serves as the auction floor. The game starts with one card face down in each of the seven spaces. 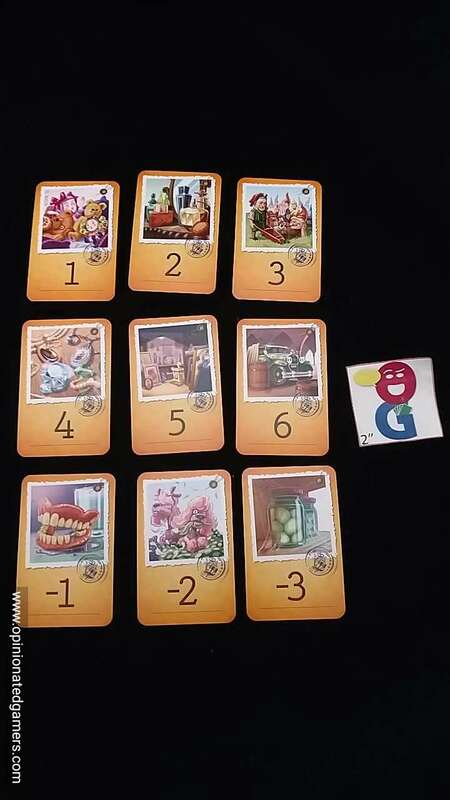 These cards are object cards representing the belongings of Lady Richmond, with values ranging from 6 to negative 3. Also shuffled into the deck are 12 Auctioneer cards which have special actions on them. Each player gets 10 coins as their bankroll as well as three cheat tiles. 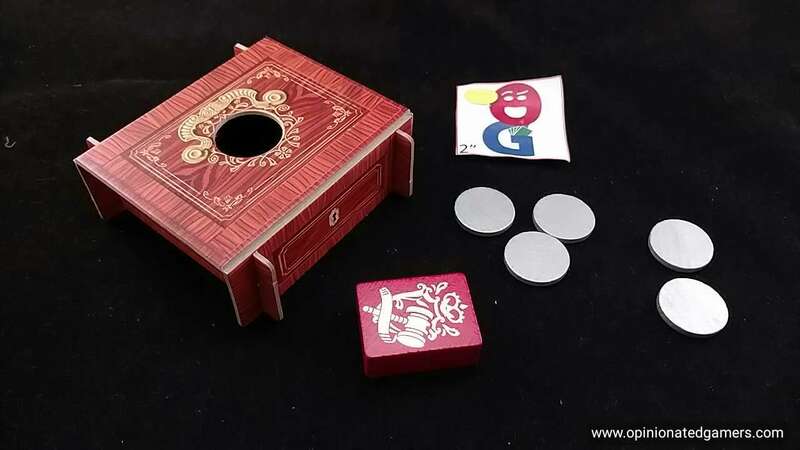 There is a cardboard money chest which will be used to hold auction payments. On a given round, the active player first flips up a card on the game board. Then, any player can decide to start an auction – which would be for all face up cards at that particular moment (more on this later). If no one decides to start an auction, then the next player clockwise becomes the active player and must turn over another card. Once an auction is started (by any player freely grabbing the Auction Block and declaring an auction) – that person makes an opening bid on all of the faceup cards on the board. Then, going clockwise from the player that started the auction, each player must either raise the bid by at least one coin or pass. Once you pass, you are out of this auction completely and cannot rejoin the bidding. Once a player has the highest bid and everyone else passes, that player places that number of coins into the money chest and takes all of the face-up cards. These cards are then placed facedown in that player’s personal stockpile. If an Auctioneer card comes up, a special action may occur (two of the cards strangely have no action and are merely empty cards). Otherwise, you might have to clear all face-up cards from the auction, perhaps clear all cards from the auction. You might end up with the opportunity for a blind auction where all seven cards are auctioned off regardless of their orientation. 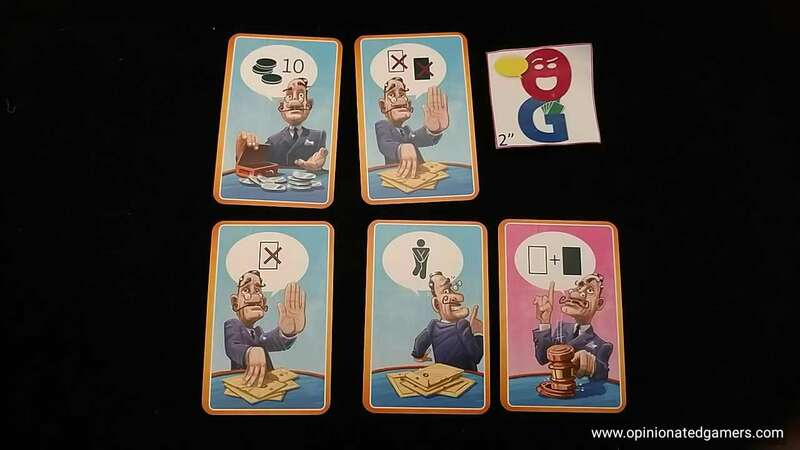 There are also 4 PayDay cards in the deck which cause all players to go back to 10 coins in their personal supply. If they have more, they must return it, and if they do not have enough, they take from the money chest. At any point in the game, you can also use any of your three cheat tiles – these are each one-use only per game. One will let you peek at any two facedown cards on the table, one lets you swap a card you have previously won (presumably a negative VP card) for one of the cards on the table. If you swap for a facedown card, you place your old card facedown as well. One lets you borrow a coin from a player – if you choose a player who has no money, then you lose the action. Again, each of your tiles can only be used once a game. If the board has all the cards auctioned off, then seven new cards are placed on the table. If the last facedown card is flipped over and no one triggers an auction, then the remaining cards are discarded and a new seven cards are dealt. The game continues until all the cards have been sold at auction or moved to the discard pile. At this point, player add up their points on their cards bought at auction and the player with the most points wins. HABA is in its second year of this line of family games, and I have felt that the games on the whole have been decent to great – Karuba was the surprise hit of Essen 2015 for me. Lady Richmond is the first foray into the auction game genre, and I guess that it would be a decent way to introduce this sort of game to someone who hasn’t played any before. The auctions for the most part are straightforward – you can see what you’re fighting for and make a bid accordingly. I suppose that there is a little bit of “gaming the system” that can be done with the free-for-all auction starting; I suppose there could be an advantage to starting the bidding as you can set the tone of the auction early or perhaps start at a bid that drives other people out automatically. However, this seems like an un-necessary complication to the game and keeps hands flying about the table as they try to grab the Auction Block. When I’ve played this with younger gamers (closer to the 8+ end of the recommended spectrum), they really had no idea how to process the possibility of the auction in real-time compared to the older gamers. Perhaps the idea is to cause a little bit of panic with the time pressure so that people maybe call auctions earlier than they really want to? I guess that the Auctioneer special cards are there to keep the game from being totally calculable. The blind auctions (if they occur) help keep some of the gained cards a mystery – heck, they’re even a mystery to the player that buys them until after the auction! The cheat tiles which allow you to swap one of your previously collected card for one of the board also helps keep the scoring somewhat opaque. This, I think, is a good thing in an auction game as it makes the auctions more interesting when there is something unknown. However, the most common Auctioneer card is the one which really takes the steam out of the sails of this game, and that is the PayDay card. When this one comes up, it resets ALL players back to ten coins. Thus, if you haven’t spent your money prior to that card coming up, you have lost momentum as everyone else now has money. I can see how this mechanism will allow players to continually participate in the game as they will get four bankroll refreshes during the game. However, with 4 of the 41 cards in the deck being Paydays, there is often not enough time for anyone to take advantage of a relatively rich position. Instead what I have seen happen is that auctions early in a cycle go for inflated prices because people are expecting more money soon, and more often than not, those players who paid for the early auctions get more money in their bankrolls to bid again. The end result is that the game tends to not reward careful planning and money management but rather rewards good fortune and good luck to have made a move before an auctioneer card comes along and levels the money situation or wipes out cards that you wanted. The auctions themselves are simple in that everything is out in the open. There isn’t much mystery to the all the non-blind auctions as there is no bonus for making sets, etc. Every card is simply worth the number printed on it – so you just have to decide how much money you’re willing to spend right now for the number of points on offer. The art is well done with large, easy-to-read numbers and symbols on the Auctioneer cards. These are really the only things that you need to see on the cards. 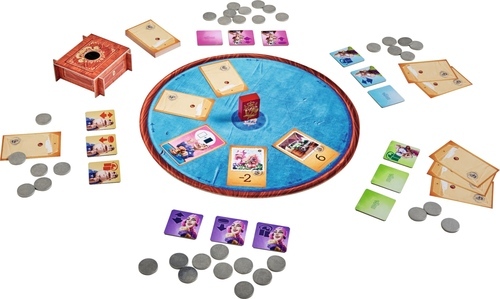 The board is possibly un-necessary as you could easily place the seven cards in a circle on the table – but it does help keep things organized and gives good reason for the middle sized box. After three plays, I’ve enjoyed my time with the game, but there really isn’t enough to keep me coming back for more. The lack of “tightness” with the money situation takes much of the zest out of the auctions for me. While I’d consider this for someone new to the Auction genre, it’s not going to replace Ra, Medici, Modern Art (or even Pizarro & Co) on my shelves in this class. I suspect that I will pass this onto our youth group at church as they are probably closer to the target audience for this game. It will likely be a hit there. It’s about time for Spiel Des Jahres predictions, guys! Can’t wait for it!